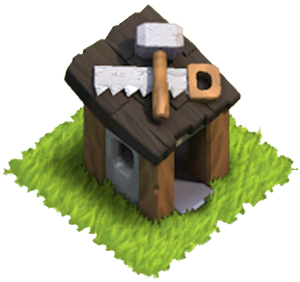 The Builder’s Hut is one of many Resource Building in the Clash of Clans game. Nothing gets done around here without Builders! You can hire more Builders to start multiple construction projects, or speed up their work by using green gems..
Each Builder’s Hut comes with one Builder which allows you to build and upgrade the structures of your base. You obtain two Builder’s Huts from completing the tutorial, with another three available for purchase by using Gems. You need Builders to construct and upgrade Buildings, Walls and to clear Obstacles. They are also required to place and upgrade Heroes. However, you do not need a Builder to place Decorations or Traps. It won’t be long until your Builders are spending 1-2 days or more on upgrades, so additional workers will come in very handy! 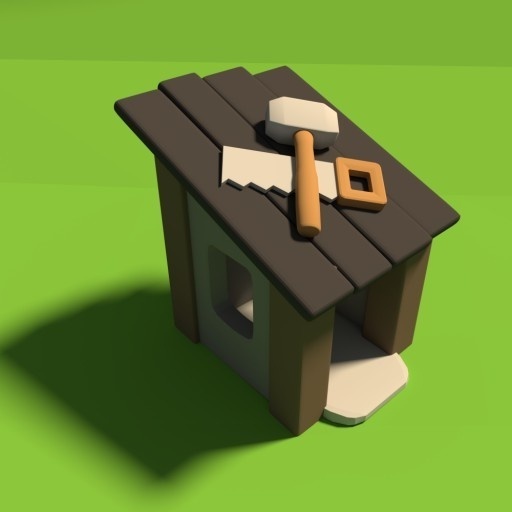 Your first Builder’s Hut is already constructed when you begin playing the game for the first time. The second Builder’s Hut costs 250 and is required to be built during the tutorial. It will use half of your initial allotment of 500 . 500 can be purchased for US$4.99. See the Gems page for prices in other currencies. Save up 500 by completing Achievements and removing Obstacles. You don’t need to spend any Gems during the tutorial (other than buying the 2nd Builder’s Hut). Saving 500 from Obstacles and Achievements is actually not difficult; in fact there is an Achievement called “Sweet Victory!” (3 stars) which rewards 450 , almost enough to buy the third Builder’s Hut by itself. The fourth Builder’s Hut costs 1,000 (you must already own the third). Buying 1,000 would cost US$9.99. The fifth Builder’s Hut costs 2,000 (you must already own the fourth). The required amount of Gems can be purchased for US$19.99. It is possible to save up enough Gems to build all five Builder’s Huts eventually, as there are a total of 8,687 available via Achievements which means collecting all the Achievements will give you enough Gems. Also, there is an unlimited amount obtainable by clearing Obstacles such as plants and rocks (plants regrow every 8 hours). You can put your Builder’s Huts in the very corners of your Village, in hopes of wasting opponents’ time getting to them when attacking – which might mean the difference between a 2-star defeat instead of a 3-star one. However, the drawback of doing so is they will be easy pickings for a single Archer or Barbarian, and each building (regardless of purchase price or hit points) counts the same amount toward 50% destruction. Builder’s Huts can be used like Walls or other buildings to push back the no-spawn zone of Troops. They can also be used to lead enemy Troops a more desirable direction (for the defender). Because units with no preferred target simply attack the next closest building once they have destroyed their current target, you can strategically place Builder’s Huts to ensure that these Troops find a string of closer buildings leading away from high-value targets such as Mortars and Air Defenses. Attackers should look for Builder’s Huts or other buildings in corners and may combat this by placing one or two Barbarians or Archers at each building at the start of a battle. They can also use those corners to lure clan castle troops without the lone archer being picked off. Builder’s Huts can be built without a free Builder. The total cost of all five Builder’s Huts is 3,750 . Note that the second Builder’s Hut is bought during the tutorial, so if you have already finished it, you would need an additional 3,500 to buy the remaining three Huts. They do not appear to have a door, or any form of resting comforts such as a bed, but there will be signs of sleeping from a builder’s hut if one of your Builders is idle. As soon as the three-minute raid timer begins counting down, all Builders will run towards the Town Hall even if it is the first building to be attacked. Even if the Town Hall is destroyed before the Builders reach it, they will still “enter” it, disappearing upon doing so. On top of the hut, there is a hammer and saw which represents the Builders. The hammer on top of the hut is not reflective of the hammer used by the Builder, and remains there even when the builder is working. When moving a Builder’s Hut whose Builder is currently unoccupied, there is a small black dot on the ground where the Builder’s Hut originally was standing. As soon as you place the Hut in a new position, the Builder will spawn on the dot and run towards the Hut. Although classified as a Resource Building, Goblins do not preferentially target the Builder’s Hut, nor do they cause double damage when attacking it. It has the lowest hitpoints of any building in the game, although it is tied with the Heroes Altar and the Army Camp at level 1. There is an Achievement for destroying a certain amount of Builder’s Huts, and it is called “Union Buster”. Builder’s Huts are unable to be upgraded. When moving an occupied hut with an idle Builder, the Builder can be seen resting on the ground where the hut originally was, and once the hut is placed he will get up and run into his hut in the new location. The image of this can be seen above to the right. The builder may sleep outside/on top of his hut, see Interesting Facts on the Builder page. If the time to destroy an obstacle is less than the time it takes the assigned Builder to reach it, the obstacle will be simply vanish when the removal timer ends and the previously-assigned Builder will, from wherever he is, immediately head toward his hut to sleep.